Heralded as a landmark set to rival the Sydney Opera House or London Eye, Portsmouth's Spinnaker Tower finally opened on Tuesday. And just like the Opera House and Millennium Wheel before it, the statuesque tower has not been without controversy, delays and overspending. Due to open for the Millennium celebrations, the project is five years late, has cost £36m and left the taxpayer footing a bill of more than £11m. When it was commissioned by city councillors the public was promised it would not have to pay a penny and that the bill would be met by lottery funding. Built to encourage greater tourism in and around Portsmouth, the tower depicts a billowing sail and stands at 170m (558ft) - it is the UK's tallest public building outside London. There are three public viewing decks, Europe's largest glass floor and a glass external lift, which caused most of the recent delays to the tower's opening date because of safety doubts. Other problems have included unfounded fears over its concrete, a highly-critical report into the council's handling of the project and lost revenue opportunities. In 2004, council leader Leo Madden resigned over delays and spiralling costs, while a council legal adviser, Barry Smith, retired after being suspended on full pay. There have also been security problems - a fathers' rights campaigner and a base-jumper have both successfully targeted the building. So has the Spinnaker tower left a bad taste in the public's mouth - or will they grow to embrace it the same way Parisians now love the Eiffel Tower, after its own early setback of protests and public disliking? "It looks alright but it's cost much too much," Richard Darrington, 73, of Fareham, Hampshire, told the BBC News website on a visit to Portsmouth. "They could have done a lot more with the money - they could have kept Haslar Hospital open for a few years with what they spent on that. People will only go up there once, won't they?" Others loved the tower. "I think it's beautiful. It's brought us down here today," said Audrey Redfern, of Brighton, who was with a group of friends. "We didn't know if it was going to be open or not - we knew it was going to open soon." She added that the tower was worth the cost to the taxpayer: "You get over it and it'll always be there," she said. Others, however, were not that taken with it. "I wouldn't have noticed it to be honest," Nicola Gilbert, 29, of Birmingham, said while walking on the quayside. "We've just walked straight past it. People can go up there can they?" 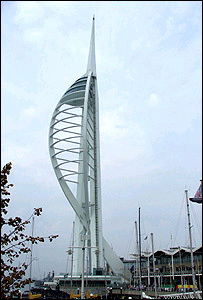 Richard Goodenough, 20, of Bognor Regis, West Sussex, said he did not like the tower's design. "It all seems a bit pointless really, this sail thing," he said, gesturing at the tower. "I'm the artist, and I like it," his girlfriend, Kate Wilson, 19, interrupted. Nicky Whelan, 29, of Portsmouth, said she was "not really into that sort of thing", but that she might go up "just once to see what all the fuss was about". She added that she was undecided about the extra cost to the taxpayer: "It depends if they're going to reap all the money back that they've put into it. I suppose they will do. I'd rather have an Ikea here." The city council's current leader, Gerald Vernon-Jackson, told the BBC News website he could not justify the extra costs to the taxpayer. "My group, the Lib Dems, opposed the building of the tower from the start and we maintain that position. "The decision to build it was wrong but we've had to see it through." He said the city council was still in negotiations with developer, Mowlem, on the final cost of the building works. He added, however, that he thought the tower was "amazing". Quelling fears about the external lift, he said: "I'm very bad at heights but I'm not scared in that lift. "You go up and you look through the ribs of the tower - I would thoroughly recommend it."